3D Spline, Patch, and Mesh, Modeling, Conversion, and Rebuidling tools. Power Modeler Pack™ offers shear 3D modeling POWER! 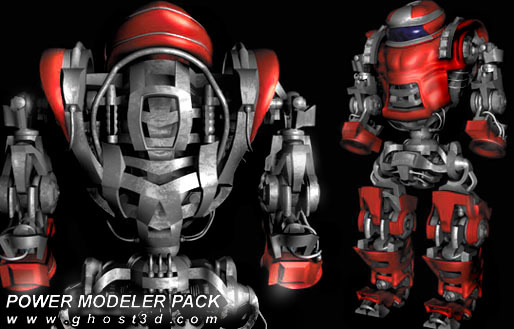 A complete comprehensive interface and integration of 3D modeling and model rebuilding tools, Power Modeler Pack provides a flexible set of tools that are modularly designed and organized for easy access and creative non-linear modeling and editing. No more confusion � anyone can make awesome models this way. � Advanced Spline based S-Objects with parametric subdivisions, for instant (click-drag) creation of detailed but optimally organized patch models. � ResErect Spline conversion (convert mesh, patch, and Splines to optimized Spline objects). � 8 powerful modules (offer specialized solutions and tool-kits, which can be used individually or modularly together). � Floating reference preview panel for previewing surfaces as you work on Splines. � No strange or incompatible object types. All object types are fully compatible with native object types for conversion, collapsing, and exporting to game engines or other applications. New tools are added from time to time, and compatibility updates are free! Don't waste time with "dead-end" technologies that stifle your creativity and leave you hanging. Get with a workflow that works for everyone. With the Power Modeler Pack your objects will be exportable and convertible to any type of object format, and compatible with any object modifier. So even if you�re a die-hard polygon tweaker, or your project requires you work with meshes, HSDS or NURBS, you can convert to and from this easy, accurate Spline-shaping surface workflow using ResErect, Spline Editor and Surf-iT output modifiers. There are modules for drag-n-drop S-objects™, surfacing that checks your work, and editing tools so well designed, integrated and fully scriptable � you�ll wonder how you lived without them. It's an indispensable toolset for Spline and Patch modelers. The power of Spline modeling taken to the limit:- everything you need to make clean, sophisticated and watertight 3D models. An extensive, robust, easy-to-learn, modular work flow for Spline, Patch, and Mesh 3D modeling techniques. Power Modeler Pack 1 includes the latest versions of Surf-iT and ResErect. � GHOST 3D makes specialized software tools for the entertainment industry. �Contact us for more information about our custom software services. �Let us know what kind of new 3D tools and utilities you're interested in!